Hip, leg and foot problems such as a hamstring strain can be the result of pelvic or spinal misalignments. They can also be caused due to over-use, or direct trauma to the area causing sprains or strains. Our Sydney Chiropractor at Advanced Care Chiropractic may use several treatment methods for patients with sprains or strains, which are vital to the healing process and reduce the likelihood of recurrence. 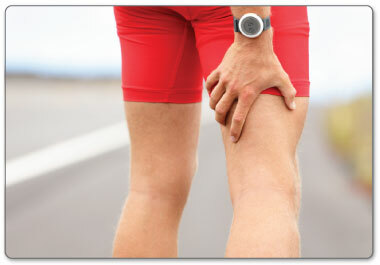 The hamstrings are the muscle group at the back of your thigh, which may often strain or tear. This type of injury is commonly treated by our Sports Chiropractor at Advanced Sports Chiropractic. A major factor that can cause hamstring strains is a pelvic misalignment which alters the function of the joints, ligaments and muscles. Hamstring strains most commonly occur during running, jumping, or when there is excessive tension due to repetition or force, eg. when footballers perform a kick. They are also commonly seen in sports such as football, hockey and athletics (particularly sprinters, hurdlers, and long jumpers), and tend to occur more commonly in older athletes and particularly following an inadequate warm-up. There are severities of hamstring strains ranging from a grade 1 to a grade 3 tear. Patients with a hamstring strain usually feel a sudden sharp pain or pulling sensation in the back of the thigh. In minor cases, they may be able to continue the activity only to have an increase in symptoms upon cooling down. In more severe cases the patient may be unable to continue the activity and will often limp or be unable to walk. It is also common for patients to experience pain or stiffness after these activities with rest, especially when first waking in the morning. Pelvic misaligments are also a major factor that cause calf strains, causing changes to the surrounding joints, ligaments and muscles of the lower limb. A strained calf most commonly occurs due to a sudden use of the muscle, for example when a person attempts quick acceleration from a stationary position or when lunging forwards such as while playing tennis. It is also commonly seen in running sports such as football and athletics, and may also frequently occur due to gradual wear and tear associated with overuse. This may be due to activities such as distance running, repetitive jumping or walking excessively (especially up hills or on uneven surfaces). Patients usually feel a sudden sharp pain or pulling sensation in the calf muscle at the time of injury, and may occasionally experience stiffness in the calf muscle in the lead up to their injury. Swelling, tenderness and bruising are often present in the calf muscle in patients with a calf strain. In severe cases, patients may be unable to weight bear or may walk with a limp. Up to 70% of runners develop injuries every year. Most injuries result either from doing something wrong, or because there is a structural imbalance in the body. Ankle sprains are common injuries to the ligaments of the ankle, that are commonly treated by our Sydney Chiropractor at Advanced Care Chiropractic. The injury has varying degrees of severity, which may include inflammation, tearing of ligaments, or the complete rupture of ligaments. Depending on the severity, ankle sprain treatment may require rehabilitation, or even surgery. Initially, our Sydney Chiropractor will assess the ankle joint, calf muscles, and achillies tendon, amongst other things. Ankle sprains are the most common injuries for athletes. And if not properly treated and rehabilitated, ankle sprains can leave behind weakness and instability in the joint long after the initial swelling disappears. Acute treatment should start as quickly as possible after the injury has occurred. The objective of the acute treatment is primarily to prevent additional injury and reduce bleeding as much as possible. Effective acute treatment will limit swelling, the formation of scar tissue and the number of complications which can arise. Malfunction of joints in the pelvis and lower back may interfere with nerves exiting the spine, resulting in referred pain, numbness, pins and needles or weakness in the legs. Nerves to blood vessels may also be affected, and can cause hot or cold changes, or pain in the legs. 2. Imbalance of other joints. This may arise at the hip, knee, ankle or foot. a. Sudden trauma – including injuries from sporting or car accidents, or from falls, knocks and sudden jolts. b. Overuse/excessive loading – resulting from repetitive strains from work, poor posture, carrying school bags on one shoulder, sporting activities, poor bedding/pillows or sleep patterns, incorrect footwear, etc. Injury and poor joint function can cause premature wear and tear, leading to osteoarthritis. Correct joint alignment, mobility, and muscle balance are essential in preventing degenerative changes. Many common problems such as sciatica, bursitis, runners knee, recurrent ankle and knee strains/sprains, shin splints and metatarsalgia respond well to Chiropractic treatment. At Advanced Care Chiropractic, we will examine your spine, pelvis, hips, knees and feet. X-rays or other scans may be taken. A course of treatments will then be recommended to re-establish normal function. Treatments may involve muscle therapy, strengthening exercises, and specific Chiropractic mobilizations/manipulations. Ongoing care may be recommended to assist in the maintenance of health, and for prevention of future problems for maximum benefit.